Getting crystal clear about what you want is the first step towards success! So many people float along, allowing life to take them wherever the wind blows, having no map for day to day actions. Without a concrete blue print, the seemingly insignificant actions you take on a day to day basis start to pile up. You say yes to the large side of fries, you eat the cake, you choose TV over a bike ride, you consume junk media instead of uplifting literature, you Drive-Thru instead of cook, and so on. After months or years without a solid blueprint, and making the not-so-great choices on a whim, you end up in a place that’s less than ideal. You don’t feel the way you want to feel. Feeling out of control is one of the most unpleasant emotions any human being can ever experience. The good news is you are the one calling the shots on your life. You are the artist and your life is the canvas, and a simple decision is all it takes to start painting a new picture. Decide today that you are the one in charge of your life, and that you are going to fight against the inertia of life, rise above it, and do the things you want to do. We all have an inner under-achiever. Every last one of us. The trick is to understand that you don’t have to listen to that inner bum. You’re on a hero’s journey, and a big part of that journey is strengthening your higher self, and starving the inner bum. The inner bum that wants you to coast along and do the bare minimum. So today, let’s create some meaningful, life changing goals, and show yourself who's boss! Goals are decisions. They are a promise you make to your higher self. What decision are you ready to make today? I know that question immediately got your brain firing, but before we jot down your goals, let’s cover how to write goals that will keep you motivated, and change your life. *Measurable. Make sure the goals you choose for yourself can be measured in some way. "I want to get down to a size 10!" Is measurable. "I want to lose weight" is not. *Exciting, stretch you and challenge you. Don’t just pick easy goals, as the easiest goals are the least motivating, and tend to be neglected. Think big, and then think bigger. Right now, fill out the Life Vision Sheet, describing what you really, really want in each category. Get specific, and don't worry about the how. Ask yourself, "if I could do anything in this area of my life, what would I want to do?" Chisel down your general wants into concrete goal statements. Once you've got your goals down, it's time to get a game plan. That's where the Goal Game Plan sheet comes in. Fill out a Goal Game Plan for each goal, and especially the goals that will make the biggest impact in your life. Over the next month, we will hopefully get you closer to achieving those goals! Taking Stock of What's Working, and What's Not. Conducting inventory of your life is best done with the good old What's Working, What's Not exercise. If you're struggling with ideas for setting goals, take a step back from your life and take inventory. Getting clear about what you aren’t happy with, what you’d like to prune away can help direct where you might want to focus your energy. Here are just a few questions to get the ball rolling for you, and to give some thought to whenever things aren't going exactly as planned. What type of person do I present to the world? What type of person do I present to myself? What are beliefs that are holding me back? What part of my personality would I like to improve? What are my self defeating habits? What are some mistakes I keep making, that I no longer want to make? Is there an emotion I struggle with that I’d like to change? 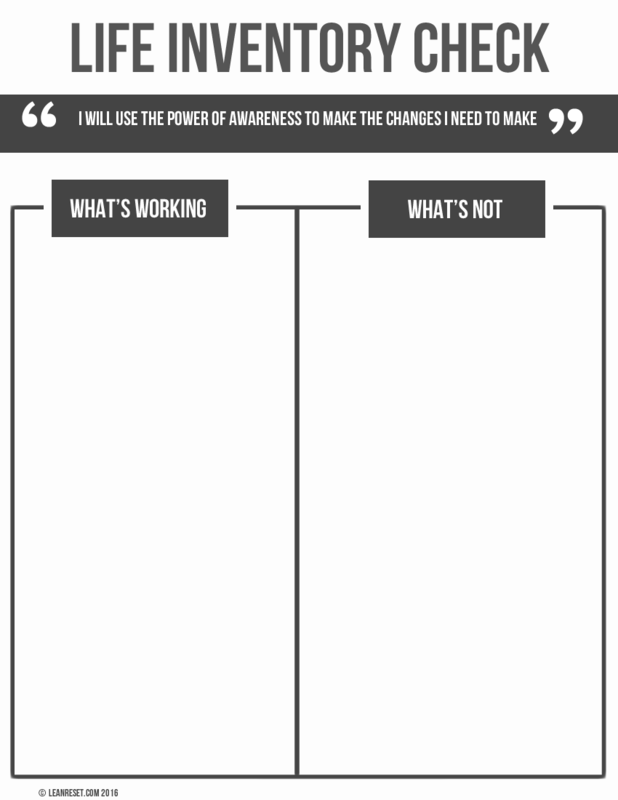 Use these questions to help you fill out the What's Working, What's Not Sheet. NOTE:There is not a sheet for this exercise, because a good ol' pen and blank sheet of paper is best for this exercise. Self image is the way you perceive yourself in relation to your environment. The image you have of yourself impacts your entire life. It effects your self esteem, the decisions you make, your interactions with the world, how you cope with stress and so on. If you have a poor self image, you’ll act accordingly. Many people don’t even realize that they have a poor self image, and don’t realize that poor self image is a common factor when it comes to self defeating habits. For example, I’ve had many clients who identified themselves as “terrible at exercise” and “lazy”. Another common self image that people cling to is being incapable of handling tough situations, or being a victim in any circumstance that isn’t perfect. The good news is, you can start to design a new self image today! Your fairy God Mother just fell from the sky, into your living room. She has a wand that she can wave around and transform you into an ideal version of yourself. What would you do differently than you’re doing today? What would your mood and energy be like? What types of personality strengths would you possess? How would your ideal self walk, talk, and interact with life? What types of hobbies would you pursue? This exercise isn't meant to push unrealistic ideals, or cause you to feel any dissatisfaction with who you are as a person. It's designed to help you get a more clear picture of the type of actions and traits you'd like to embody. If your ideal self has neatly ironed shirts, or is always on time, these give you clues on the things you can start doing to help your self image. Trying to match a healthy, realistic, positive self image through action is a powerful way to build self-esteem. Your entire life is shaped by your beliefs. That includes the state of your health. Beliefs become the invisible dog fence that you build your actions, thoughts, relationships, and entire life around! Some common beliefs are “I have fat genetics” or “Exercise is a chore” or “I’m a mom now, so my fit days are behind me” or “Change is impossible for me. I’ll always be this way”. The bad news is if it’s true for you, it’s true. The good news is, you can get some new, empowering beliefs to help you change your life! There’s a good chance that you have some disempowering beliefs that you don’t even know about! If there’s something you’re constantly struggling with in your life, that’s an indication you’ve got some belief pruning to do. How do you think a person with the belief of “I’m too busy to cook and exercise” is going to hold up health wise in the long run? Even in the short run, for that matter. Having this seemingly little disempowering belief hanging around is like having a destructive virus camping out inside your brain, sucking the life and energy out of you. If you’re too busy to eat healthy and exercise, then you’re essentially too busy to take care of yourself. Knowing that your life is a direct reflection of your beliefs is one of the first steps towards health, success, and happiness. It gives us the power to take a good look at what’s happening, what we do and don’t like, and most importantly, the ability to change things for the better. And if you haven't started it already, take the plunge and fill out the Beliefs Sheet to start seeing massive changes today! Another common belief that people might not even realize they have is “Comfort is better than change” or “Easy is better than work”. In other words, a fluffy couch is better than a walk outside, the pop tarts are better than the boring egg whites, and staying exactly the way I am feels SO much better than the work I’d have to put in to change what I don’t like. There’s nothing wrong with resting, relaxing, or being happy with yourself. But if there are things about your life or your health that need changing, then it’s time to change it! What’s are some disempowering beliefs that you can transform into positive ones? Trimming away the mental fat, and flexing the empowering part of yourself is the first, most important step in lasting change. Each person has different beliefs that need changing. It would be impossible for me to predict which beliefs your life experience up to this point has imparted upon you. That’s something only you can do. When it comes to disempowering beliefs, the “I’m a victim of my circumstances” belief is the destructive one I see most frequently. This belief makes permanent change impossible. It takes away your power to create something different or better. The bottom line is every single result is born out of YOUR decisions. This is an amazing realization, because it means at any moment, you can change the things you don’t like.